Barnt Is Cologne Based Producer Which Is Known As A Member Of Magazine (Artist&Label). 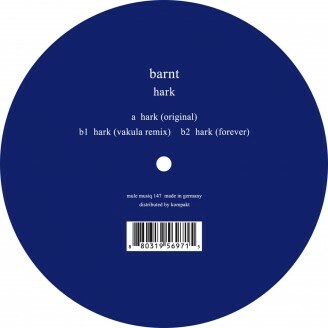 We Really Loved Barnt 12" And Magazine Stuff On Their Label And Very Happy New Barnt 12" Is Released On Mule Musiq. Original On A Side Is Like A Dark House Remix Of Goblin (Italian Progressive Rock Band). If You Like Dubby Techno Sound Like Echospace Or Redshape,You Will Into This Track Very Easily. On B Side, One Of The Best Artist At The Moment "Vakula" Made Warm Deep House Remix. It's Not Necessary Bla Bla... About Vakula Sound. Ambient Version Is Lovely Bonus Track.